Mary Merlino at the Essentrics class at the Steinberg Wellness Center for Mind and Body. Stuart Grey sometimes conducts a silent survey on the subway to assess what percentage of his fellow riders are squinting at phones, tablets, or laptops. But his primary concern is not about antisocial behaviors. As a chiropractor, he worries about what he sees as a growing trend of musculoskeletal deterioration related to screen use. Younger and younger patients are turning up at Grey’s Brookline chiropractic practice — and he thinks he knows why. Screen use, he contends, is correlated with an increasing number of chronic problems he sees in the cervical and upper thoracic spine. Lauren Mayhew even has a term for this: “text neck,” or “i-hunch” — the “I” referring to devices such as iPhones and iPads. 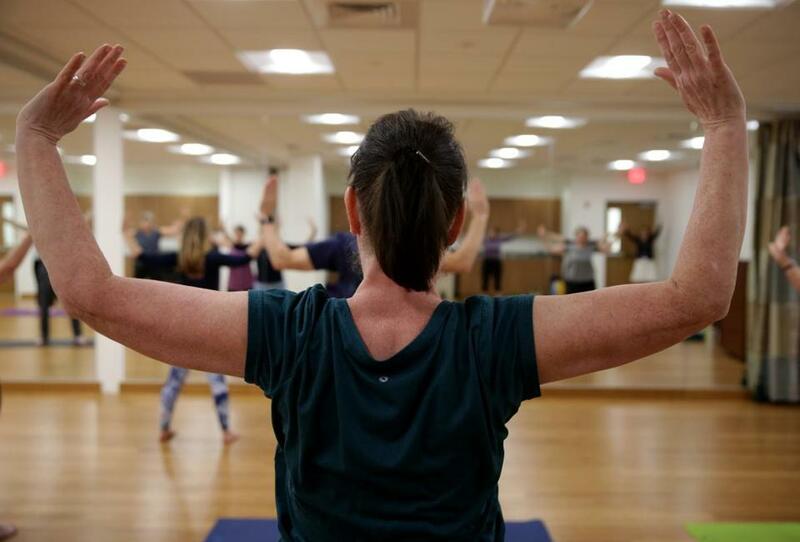 Mayhew is a board-certified health and wellness coach who teaches a method called Essentrics both at MIT and at Emerson Hospital’s new Steinberg Wellness Center for Mind and Body in Concord. The demographics may be somewhat different but the problems are the same: chronic stiffness or muscle soreness caused by poor sitting habits. A study published in the The Spine Journal last year also raised concerns about text neck. People often look down when they text, holding their necks at around 45 degrees or more, according to a Reuters article about the study. A person’s head typically weighs around 10 to 12 pounds when in a neutral position facing forward. Flexed forward at 15 degrees, it feels like 27 pounds. At 60 degrees, it feels like 60 pounds, increasing stress on the spine. Some young patients who shouldn’t yet have back and neck issues are reporting disk hernias and alignment problems, according to the study’s authors, who are surgeons at Cedars-Sinai Medical Center in Los Angeles. So what’s a screen addict to do? Mayhew’s Essentrics classes focus on taking a full-body approach that she describes as rebalancing the body by equally stretching and strengthening every muscle. Renee Saindon, an MIT administrative staff member, started taking Mayhew’s class 18 months ago. Even recognizing the problem doesn’t always solve it, she said. The improvement isn’t just in Saindon’s imagination; at her last physical, she measured half an inch taller than she had a year earlier. Michael Cook, an Acton-based athletic trainer who works with competitive figure skaters, hears frequent complaints from his clients about pain in their backs or necks. He helps with strengthening exercises, but he also tries to turn their focus to behavioral changes. “Even when my clients think they are relaxing, sitting in bed watching a movie on their computer screen, they are propped with their heads turned down to look at the screen in a way that is not ergonomically correct,” he said. Kathy Cobb, dance instructor and artistic director at Stage Door Dance Theatre in Marlborough, started teaching dance in 1999, just before the explosion of mobile device use, and she can pinpoint the differences that cellphones have made for her students. “Today, a higher percentage of dancers have more difficulty keeping their chest and head lifted,” she said, comparing her current students with those she saw 10 or 15 years ago. But Cobb’s students, who range in age from about 3 to 20, have an advantage over the general population, she said: they have already made physical activity a priority. “I can help them nip it in the bud when I start to see it,” she said. To be sure, it’s a problem for people of all ages. Novelist Erin McCormack of Bedford, who is in her fifties, acknowledges that she too has a tendency to hunch when working — especially if she’s engrossed in writing a dramatic scene or a bit of fast-paced dialogue. Bothered by pinched nerves and other pains that she attributed to sitting at her desktop computer, McCormack explored such options as dictation software, but instead found her solution in a more ergonomically designed work station and a regular practice of yoga. Lauren Mayhew leads an Essentrics class at the Steinberg Wellness Center for Mind and Body.